This week saw Agilent launch ChromNews, a portal for scientists, lab managers and researchers involved in the chromatography industry to discover the latest industry trends and solutions for analytical challenges. 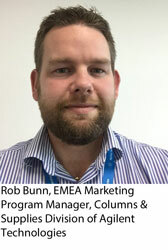 To learn more about the site and the challenges within the industry, we spoke to Rob Bunn, EMEA Marketing Program Manager, Columns & Supplies Division at Agilent Technologies. AB: Can you tell me more about the principles behind ChromNews? Rob Bunn (RB): ChromNews was originally designed to provide Agilent’s customers with easy to access information about the latest offers on chromatography supplies and resources and events. However in recent years the way our customers consume information has changed and we knew that ChromNews needed to evolve to continue to meet the needs of the industry. Traditionally, the life science industry has been slow to get on board on the digital bandwagon but scientists and researchers are increasingly looking online to discover latest industry trends and innovations. In fact, research has shown that in 2013 72% of life scientists regularly used a mobile device to support that research efforts in the laboratory. The way people search for information and make purchasing decisions has changed; according to Google, non-branded searches account for 78% of all search engine referrals. Consumers in the life sciences industry now have access to a wealth of information online and can be much more proactive when it comes to finding solutions to the challenges they face. ChromNews meets the needs of the chromatography industry with solutions-driven articles, resources and events. The new ChromNews site has been designed to provide users of analytical instrumentation, chromatography consumables and services with a unique online platform where they can easily access content that addresses challenges facing their businesses. Ultimately, ChromNews is designed to inform our target audience of the latest solutions to current industry challenges, provide a platform for chromatographers to discuss tips and tricks with their peers to encourage and inspire visitors to deliver innovation. AB: What can visitors to the site expect to see? RB: ChromNews is aimed at scientists operating in Europe, the Middle East, Africa and India. The site continues to provide special offers and product information but now has four key editorial sections; Gas Chromatography, Liquid Chromatography, Sample Preparation and Supplies. Covering applications such as food safety, pharmaceutical analysis and environmental testing, there really is something for everyone! The site can is available in seven different languages to ensure customers in the different regions of our business can benefit from the knowledge available. ChromNews provides tailored offers and promotions for products in visitor’s regions so I’d encourage visitors to bookmark the site and keep checking back to make sure they take advantage on the latest offers on their favourite Agilent products! The site’s comprehensive Resource Center also boasts a wealth of useful tools including method calculators, product finders and troubleshooting videos. As the industry continues to socialise, ChromNews will continue to evolve in line with these trends. We are committed to providing information through the most appropriate channels to provide laboratory professionals with the information they need to continue to innovate. Visitors also have the option to register for the ChromNews newsletter to keep up to date with the latest content and offers. AB: What are some of the key challenges your customers are facing, how will ChromNews assist researchers in overcoming them? RB: Our customers operate across a wide range of markets including food, energy, environmental, pharmaceutical, research and diagnostics so the challenges they face can be very specific. On a more general level the day to day challenges associated with meeting regulatory requirements and improving the quality of results more cheaply, faster and with less resource are common frustrations for many of our customers. The editorial content on ChromNews has been created to share Agilent’s expertise and knowledge with the wider industry to give them access to the solutions they need to overcome their everyday analytical challenges. Not all of our customers buy directly from Agilent but from our channel partners. ChromNews will provide those who buy their chromatography products from other sources with non-promotional and helpful information that they may not otherwise have access to. With topics ranging from how to achieve enhanced analysis of mycotoxins in food and feed using the appropriate sample preparation techniques to simplifying the complex mAb characterization process using bio-columns optimized for glycan mapping we hope that visitors will find the answers to their questions and discover new approaches to their analysis. The great thing about ChromNews is that it’s an interactive platform, so if there’s something you want to know more about and it’s not currently featured on the site, let us know and we’ll do our best to help. AB: What are some of the current trends you are seeing within chromatography and is there significant variation between sectors? RB: Recent trends and innovations within the chromatography industry have been designed to make lab analysis easier and more productive. The separation column is arguably the most important part of the HPLC system and recent developments in chromatography columns have led to improvements in analytical performance that represent the future of HPLC. The drug and pharmaceutical industry increasingly requires more efficient, faster and more inert columns and as the market for HPLC columns continues to grow, more techniques and technologies have become available to help scientists push their research further. Remarkable advances have been made in particle and stationary phase technology since its inception and in the pharmaceutical laboratory superficially porous particle (SPP) columns are now a preferred column type. Superficially porous particles have been shown to have major advantages over totally porous particles in the areas of efficiency, speed and batch to batch reproducibility. When combined with high flow rates at pressures up to 600 bar these columns can further reduce the analysis time for complex mixtures and further enhance the efficiency of separations. SPP column technology represent the most significant advancement in LC technology driven by the needs of the market to achieve efficient HPLC analyses with conventional, lower pressure instrumentation. Alongside these more general column developments, innovative new techniques and methods within the pharmaceutical industry will open up more opportunities – and challenges – for column manufacturers. For example, as biopharmaceuticals such as monoclonal antibodies and peptide-based compounds continue grow in the drug market, columns capable of providing high recovery separations of biologically-derived compounds, oligonucleotides and biosimilars, both neat and in biological fluids, will be in big demand. Column manufacturers are already responding to this call with bio-compatible columns that provide more selective separations with higher recovery rates. Complex analyses are required for the research and development and manufacturing processes for biopharmaceuticals. The analysis of these complex compounds typically take a long time and in an industry where time is money, the ability to achieve fast analysis without sacrificing the integrity of the sample is essential. Choosing the right chromatography supplies, regardless of the specific application, is key to achieving high quality, reliable and robust results and the industry is increasingly looking for tailored solutions for their analysis.